I am proud to live in this country. I am glad I was born here. Out of all the countries in the world, from the most impoverished to the most wealthy, God put me in the United States – and he put me here for a reason. I often wonder what my life would be like if I had been born in Kenya, or Italy, or Antarctica. I am proud of my country, no matter how many times I might rant about the government or its current leadership. Although America is one of the youngest countries, it is also one of the most successful. For the most part, we have had some brilliant leaders, entrepreneurs, and other people who are willing to do right by their home sweet home. America might not have the rich, ancient traditions that many other countries have. Other countries may be laughing at us, calling us “fat” and “lazy” (which is ironic, considering we work more hours than people do in some European countries), but America stands strong. We have a mixture of talent and intelligence from all over the world and we have freedoms that are unmatched practically anywhere else. America is not a perfect country and that’s fine. Every country is made up of imperfect people. Our government may be flawed at times, and our leaders may make some mistakes (however large), but I believe that we, as a country, will pull through. We still have the power to speak out and let our government know how we feel about it. That’s more than I can say for lots of other countries. I am proud of our troops. All those brave men and women who are serving our country now and have served in the past deserve much more recognition than they get. They fight for our rights. They keep our country safe and strong. Even when I’m ranting about the government, I will continue to support our troops – no matter what. I admire every person who has sacrificed for this country. You are all my heroes. It’s good to be proud of your country! 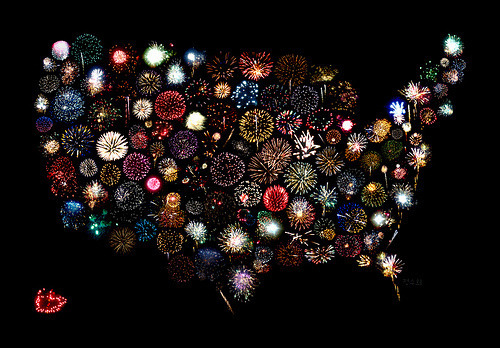 Happy 4th July! Thanks for looking at the positives on our nation’s anniversary. She’s a grand old flag . . . and forever in peace may she wave.